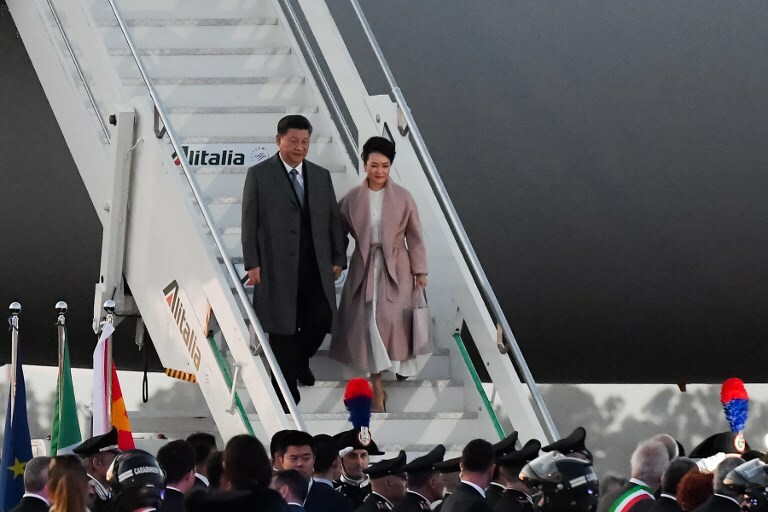 From March 21 to 25, China’s President Xi Jinping will be on a week-long tour of Italy, Monaco and France. Coming on the eve of the second summit of his pet project Belt and Road Initiative (BRI) next month, Xi’s on-going tour appears to be an effort to make major inroads into the sanctum sanctorum of the U.S.-led trans-Atlantic alliance involving the world’s most industrialized economies namely, the G7. Italy is becoming the first of the G7 to join the BRI. And for China’s this will mark a fundamental shift in its ever-evolving character. The BRI has so far been focused on building infrastructure projects only in developing and least developed countries. Italy is not just one of the most advanced economies, it is the fourth largest economy in the European Union (EU) — after Germany, the United Kingdom and France — and eighth largest in the world. Thus, Italy’s partnering with the BRI has significant implications both for China’s ascent as also for the sustenance of the West’s leadership of global governance. Against this background, the angst in the Trump administration is palpable. Without doubt, Italy’s endorsement of the BRI threatens to undercut President Trump’s ‘maximum pressure’ strategy to up the ante by raising tariffs on imports from China. The tariff hike had pushed China’s into its slowest growth rate in the last four decades. In the longer run, the abundance of infrastructure building by Chinese companies in more than 80 countries across Europe, Eurasia, African, the Middle East, and now in Italy, poses a formidable challenge to the over two-centuries of Western economic supremacy and their monopolistic control over global financial institutions. Various American leaders have talked of “debt traps” and vice president Mike Pence has delivered a series of sharp speeches criticizing China’s style. At stake are the United States’ trillions of dollars of monetary and military investments around the world that have witnessed a crisis of credibility with China’s unprecedented rise in the last four decades. Closer home, the EU has also been feeling the heat of China’s BRI projects across Croatia, Czech Republic, Hungary, Poland, Greece, Malta and Portugal. Europe’s 16+1 grouping — that includes 11 EU members — have come to be the new locomotive of China’s cross-country projects across Central and Eastern European states; each one reinforcing China’s expanding footprint and luring others who may be still sitting on the fence. Examples of Greece and Portugal, where China has invested billions dollars since their financial crisis, have become role models for other European states that urgently need to revamp their ageing infrastructure to boost their economic growth and development. The BRI juggernaut has surely germinated anxieties amongst major European powers. It is interesting to note that Italy’s Luigi Di Maio, the leader of the anti-establishment Five Star Movement — which is both anti-American as also Eurosceptic — has been supporting China’s BRI. In the face of these fast changing kaleidoscopic crosscurrents within Italy’s domestic politics and also in the face of the strong opposition from the United States and criticism from various European countries, Italian leaders appear hopeful of signing at least a ‘non-binding’ MoU which would still imply Italy’s joining the BRI. Italian leaders explain their joining China’s BRI saying that it will help address the problem of continuing trade deficits. Exports to China and access to AIIB funds for Italian development projects will be enabled. By taking the first baby-step of joining the BRI, Italy is expected to procure contracts for infrastructure projects worth a few billion dollars. China is especially interested in engaging Italian ports for turning these into its gateway to Central and Western Europe. Indeed, like Italy, like other U.S. allies have been drifting gradually towards Beijing’s orbit. In what appears to be a defensive stance in anticipation of the likely outcome of Xi’s visit to Italy, French President Emmanuel Macron last week reiterated the urgent need for the EU to evolved a “coordinated approach” towards China. “Its a good thing that China is participating in the development of many countries, I believe in the spirit of equality, reciprocity. The spirit of equality means respecting the sovereignty of nations,” he said. Rather than asserting traditional French pride, this sounded more like cry for help. British Prime Ministers Theresa May had refused to sign any endorsement of the BRI during her visit to Beijing last year. But that was driven more by the crisis at home making her position as national leader untenable. In spite of expressed concerns from the Obama administration, Prime Minister David Cameron had decided in favor of becoming the founding member of China’s Asian Infrastructure Investment Bank (AIIB) that will now be financing BRI projects in Italy. Slow growth rates across Europe are likely to continue making them vulnerable to Chinese offers of quick finance and turn-key projects. EU has ambitious plans like the Trans-European Transport Network plan that seeks to connect Armenia, Azerbaijan, Belarus, Georgia, Moldova and Ukraine. But these projects to connect six ports and 11 logistic centers involve building of over 4,800 km of road and rail that require and estimated US$ 15 billion. This again could invite Chinese investments. But a pertinent question is as to what does such a rapid outstretching imply for China’s future? There have also been contrarian voices audible inside China seeking an audit and assessment of investments abroad. Therefore, China has been constantly revisiting and reassessing the BRI. It has been a hard learning process for China’s leaders as well.